* Uploading/downloading many files at the same time. * Handle different time zone. * Synchronize files correctly even if the time zone between local computer and FTP server is different. * File integrity verification by CRC. * FTP Synchronizer supports secure connection. Like SFTP, SSL etc. * FTP Synchronizer supports proxy/firewall. * Easy to integrate FTP Synchronizer with your business; You can also use your favorite scheduler, e.g. Windows Scheduler, to automate FTP sync and run FTP Synchronizer as a service. * Automation. Run profiles automatically. Emsa Time Synchronizer: Atomic time sync utility for Windows. Freeware. It can copy, encrypt or compress files in gzip format. xSync is a comprehensive solution for file and folder synchronization. 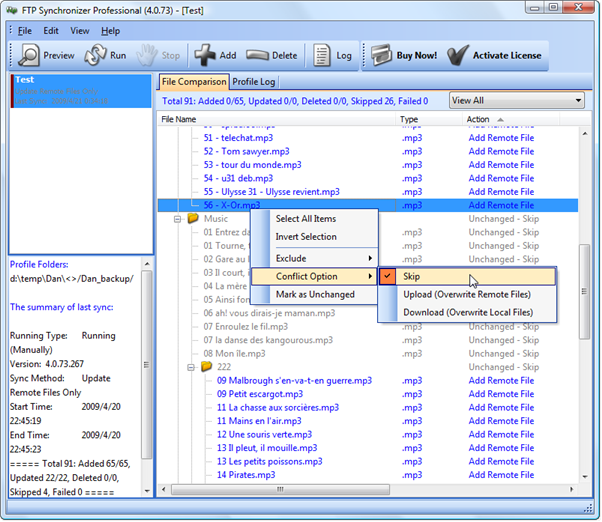 Synchronizes computers, disk, folders using copy, encryption, compression. Qweas is providing links to FTP Synchronizer 5.1.92 as a courtesy, and makes no representations regarding FTP Synchronizer or any other applications or any information related thereto. Any questions, complaints or claims regarding this application FTP Synchronizer 5.1.92 must be directed to the appropriate software vendor. You may click the publisher link of FTP Synchronizer on the top of this page to get more details about the vendor.